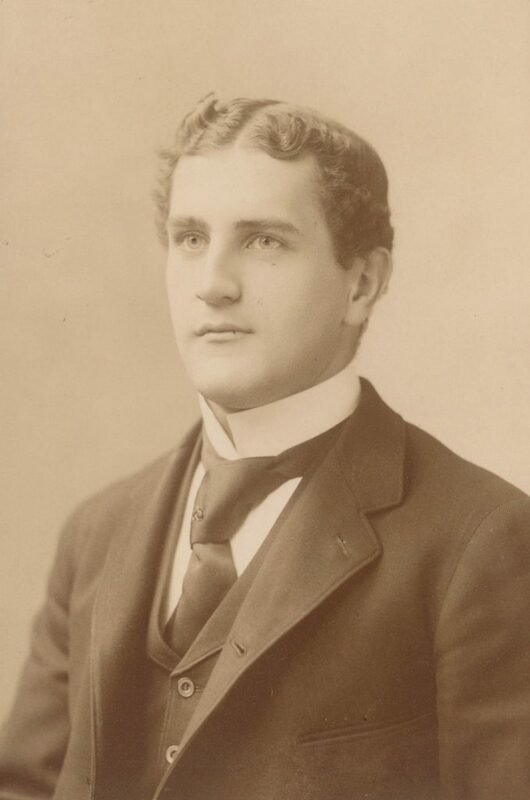 Robert Edward Glendinning was born on January 28, 1867, and entered the University of Pennsylvania in 1884. He was the son of Robert Glendinning and Ellen Elizabeth Butcher. Glendinning’s stay at the University of Pennsylvania was a very short one; he attended for only his freshman year. During his freshman year he was a member of the shooting team, cricket team, baseball team, tug-of-war team, Racket Club, and Canoe Club. He was the marshall of the University Republicans, chairman of the Constitution Committee, chairman of the Baseball Committee, and chairman of the Freshman Committee. He won the standing broad jump during the spring sports competition. As an undergraduate, Glendinning also served as one of the models for Eadweard Muybridge’s landmark study, Animal Locomotion. He lived in the Zeta Psi fraternity until he was dropped from the rolls owing to his absence during examinations. After his short sojourn at University of Pennsylvania, Glendinning became very successful as a banker and head of Robert Glendinning and Co. He was the first person from outside New York to hold the position of governor of the New York Stock Exchange. He was also a member of the New York Curb Exchange, Philadelphia Stock Exchange, and Pittsburgh Stock Exchange. An aviation enthusiast, he contributed substantially to American wartime aviation during the First World War. For his service as commander of the American air force in Italy, Glendinning was awarded the Italian Order of the Crown by the Italian King Victor Immanuel. He also served in the Spanish-American War. Before ending his military career as a colonel, he was awarded the Distinguished Service Medal by the United States government. A resident of the Chestnut Hill section of Philadelphia, Glendinning was one of the founders of Chestnut Hill Hospital, Philadelphia School for the Deaf, and the Philadelphia School of Aviation at Essington (later Chandler Field). He served served at various times as treasurer of the Fairmount Park Commission, director of the Philadelphia Zoological Society, and finance chairman of the Republican State Committee. His interesting and successful life was ended by pneumonia on April 20, 1936.